STORY: A fleet of vintage motor cars and bikes, hit the streets of northern India’s Lucknow city as a part of anannual vintage car exhibition on Sunday (December 02) presenting a spectacle for the residents. The rally was flagged off from the vintage motor exhibition by the district magistrate of the region, Kaushal Raj Sharma and was organised as a part of the ongoing Lucknow Mahotsav (festival) which began on November 25 and will end on December 05. 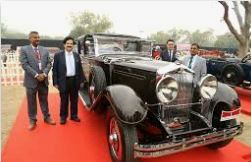 Sharma said that over 50 vintage cars and bikes which are 80-90 years old, participated in the annual rally and the administration tries to organise this rally every year so that the residents of Lucknow can get a glimpse of these beauties and appreciate it which will in turn inspire the owners. As per reports, the vehicles that took part in the show were 1935 Fiat Balilla, 1911 model Merryweather car, 1926 brand Austin hit the road first, Ford Roadster, Austin 6, Chevrolet Phaeton, Morris, Jaguar, Humber, Singer Bantam, Fiat, Ford Custom and other vintage models of Austin, Ford, Morris and Chevrolet.